You have added Glam Reddish Pink and Beige Heavy Embroidered Net Designer Lehenga to your Shopping Bag! Showcase your ethnic love with a difference in this reddish pink and beige designer lehenga that is set in a soft net fabric. The blouse comes in a bridal net fabric with a shantoon inner and a net dupatta. 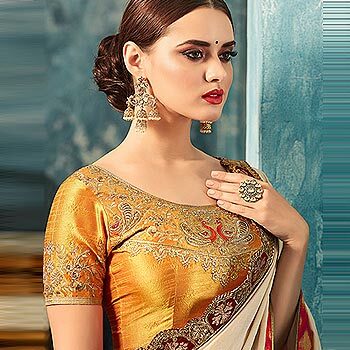 Witness beautiful gold embellishments and rich artwork on the lehenga and heavy blouse that is finished by a beige net dupatta featuring a stunning border. Designer Lehenga Choli in Beige & Ruby Red with Zari..